I recently upgraded the whole media consumption set-up in my apartment. This post describes all of the different aspects, hardware and software components in use. Mac Mini – this is the main hub of the whole operation. It sits in my living room, connected to sound system and projector. Specs: 2.3GHz i5, 2GB RAM, 500GB HD, Intel HD 3000 Graphics. Apple TV – the new 1080p one. Connected to the LCD TV in my room. iPad – also the new one. Projector – still the same old one that won’t die. Only 720p, but I refuse to replace it before it has reached the end of it’s lifetime. Logitech Harmony – universal remote to control the cable box, sound system, projector and XBMC (via Mac Mini’s infra red port) in the living room. 2TB harddisk – connected to Mac Mini via USB. 2x AirPort Express – connected to speakers in the kitchen and bathroom. 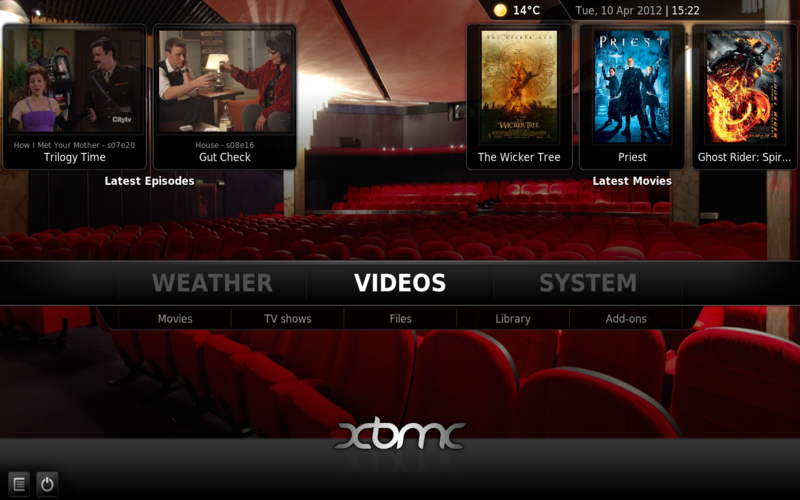 XBMC – with it’s recent Eden release and a few configuration tweaks the perfect, easy to use frontend for all my movies & TV shows. Transmission – Torrent client with a nice web based remote frontend. Catch – to automatically download new TV show episodes. Air Media Server – serves media to iOS devices. AirServer – receives AirPlay streams from iOS devices. 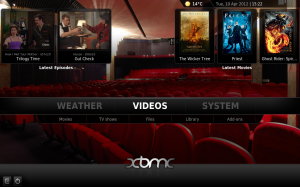 Air Media Center – plays movies and music from Mac Mini via Air Media Server. TouchPad – substitutes mouse and keyboard for Mac Mini. Mocha VNC Lite – remote desktop software. Apples Remote App – controls Apple TV or iTunes music on Mac Mini.